Home › Personal Injury › Auto Accidents › How do you get paid for your lost wages? Personal Injury Requirements: If you are injured in an auto accident caused by someone else’s negligence, then you entitled to reimbursement for your medical expenses, pain and suffering, lost wages, and when applicable punitive damages. It doesn’t matter if the accident involved a car accident, truck accident, motorcycle accident, bicycle accident, or pedestrian accident. Hiring our auto accident lawyers will make sure that you are compensated for all of your personal injury damages including your past and future lost wages. When are lost wages usually paid? The adjusters usually refuse to pay for any of your medical expenses or lost wages until a lump sum personal injury settlement is reached. Our personal injury lawyers at the Griffin Law Firm make sure your lost wage claim is fully documented. This can be more challenging if you are self employed or if you are paid primarily through commissions. Who has to pay you for your lost wages? You must recover for your personal injury claim against the negligent driver’s insurance company first. The negligent driver’s coverage is primary and is referred to as liability auto coverage. In Georgia you cannot ask for a settlement from your auto insurance unless the negligent driver is uninsured or under-insured. This coverage is referred to as uninsured or under-insured motorist coverage. 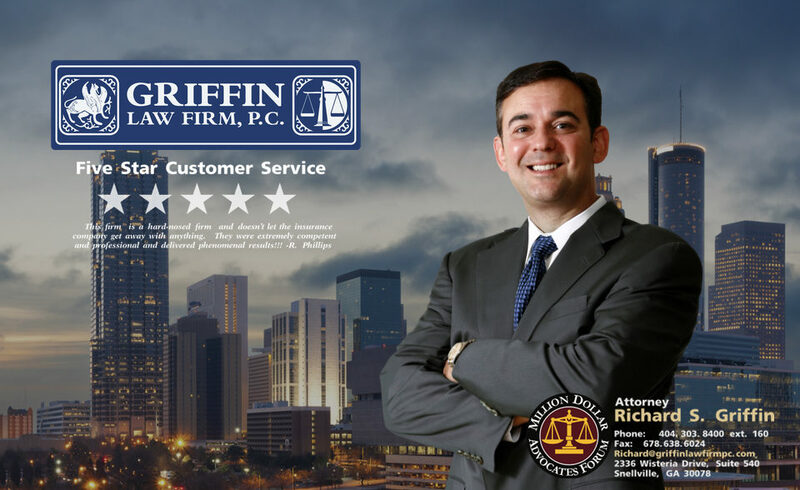 Attorney Richard Griffin knows how to verify the policy limits of all of the insurance polices that cover your claim (liability, UM, umbrella, general business liability, or med pay coverage. For the seriously injured, we are often able to negotiate the policy limits from each insurance policy by properly stacking the coverages. It is very common for a personal injury claimant who is not represented to make a mistake in the stacking of the different policies. These mistakes can be huge costing you hundreds of thousands of dollars for larger cases. How much lost wages will you receive? Lost wages can include your post lost wages or income, as well as, the future income you may loose as a result of your auto accident related injuries. Our car accident lawyers will get future lost wage information from economists when the personal injury client suffers catastrophic injuries or a wrongful death. Hiring our attorneys means that we will advance the money needed to obtain the needed expert opinion for your case. What documentation is required for a lost wage claim? Attorney Richard Griffin normally recommends that you get a doctor’s excuse from your doctor for all time missed from work due to your personal injury claim. We also strongly recommend that you have your employer fill out a Wage & Salary Verification that we provide our clients to fully document from your employer how much income you lost. If you are self-employed, then we often have to document your lost income through the use of lost contract documentation, tax returns, bank statements, and other financial documentation. Free Case Evaluation: Call us today at 877-524-7070 or 877-PAIN-LAW to find out how much your lost wage claim is worth and to learn how we can help you get the personal injury settlement that fully compensates you for your past and future medical expenses, lost wages, pain and suffering, and even punitive damages.